I’m not a big social media fan. I don’t maintain a Facebook page or have a Twitter feed. But lately I’ve been checking out some Facebook pages linked to Parks Canada or created by local support groups. Without exception, I’ve discovered some great current news posted by Canadian Rockies park staff and visitors. Unlike a lot of personal Facebook sites, you can access all the posted information without being a Facebook member, though you will have to sign up to “Friend” some contributor’s sites or create your own postings. 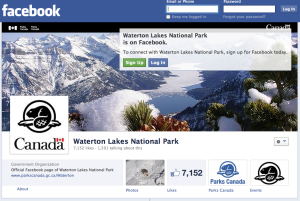 All Canadian Rockies national parks have active Facebook pages, but one of my favourites is Waterton Lakes National Park-Facebook. Waterton is a very active and close-knit community, so there is a lot of participation on the site summer and winter. And as with Facebook pages for other parks, click on one of the photos and then page through an amazing collection of recent “Timeline Photos”. Another of my favourite sites is the Jasper Trail Alliance-Facebook. The Alliance is an offshoot of the Friends of Jasper. I’ll be writing more about this group and its Facebook page in future, but if you’re interested in anything dealing with the Jasper backcountry at any time of year, this is the place to go.